The Metropolitan Museum of Art is home to one of the world's most diverse and important collections of musical instruments. With over 5,000 examples from six continents, it is unsurpassed in its scope and includes instruments from nearly all cultures and eras. "With its outstanding collection and comprehensive Department of Musical Instruments, The Met has for decades exhibited, celebrated, and contextualized the global artistic vision and extraordinary craftsmanship involved in developing musical instruments", said Max Hollein, Director of the Museum. 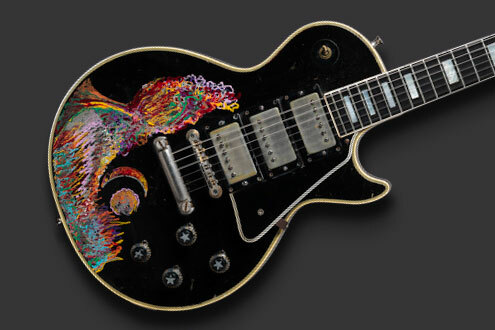 “The exhibition allows us to appreciate the artistry of the instruments as well as their powerful role in the creation and expression of rock's legendary sound and identity." The exhibition is made possible by the John Pritzker Family Fund, the Estate of Ralph L. Riehle, the William Randolph Hearst Foundation, Diane Carol Brandt, the Paul L. Wattis Foundation, Kenneth and Anna Zankel, and the National Endowment for the Arts. It is organized by The Metropolitan Museum of Art and the Rock & Roll Hall of Fame. Below: The exhibition is accompanied by a catalogue available via The Met website.